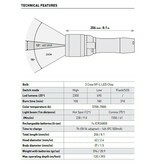 Rent a Mares EOS 20RZ 2300 lumens dive lamp! The price shown is the rent per day! 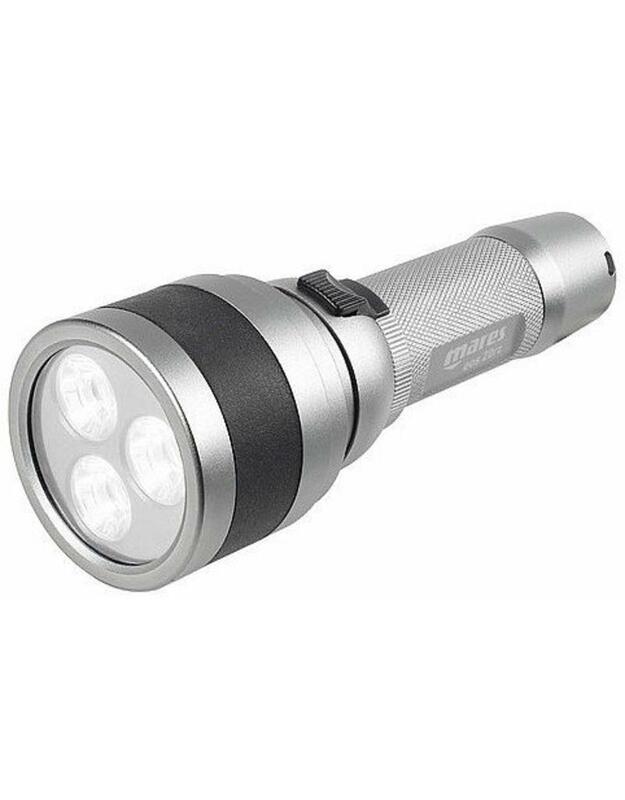 The Mares EOS 20RZ is an extremely versatile lamp that can be perfectly used as a primary lamp during recreational diving or as a backup during extreme diving. 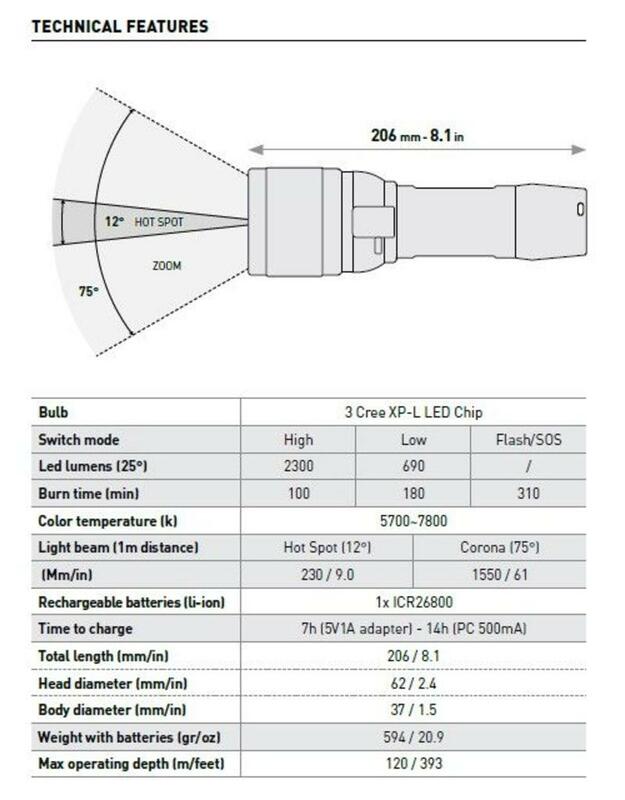 It is possible to set the light beam of the 2300 lumen LED light from 11 ° to 72 °. The multi-position magnetic slide switch can be operated with the thumb. The battery can be charged using a USB cable. Thanks to the construction of corrosion-resistant anodized aluminum, it is a robust, durable lamp that can be used up to a depth of 120 meters. -Slippable safety switch to lock the main switch during transport. 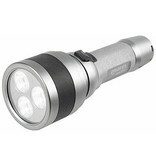 -Magnetic zoom on ALL versions for easier operation at any depth. All our MARES rental diving materials have been purchased in 2018 and are maintained according to the guidelines by a certified MARES maintenance expert, alongside they are thoroughly inspected and cleaned after every rental day, so you are sure that you will get a safe diving equipment when you rent it from us. ! -The display of a valid diving license & logbook is mandatory. -A valid passport, ID card or driver's license is issued as a deposit. We rent everything, but strongly recommend you, purely from a hygienic point of view, to buy a diving mask / snorkel and set of diving shoes, our staff on board will be happy to help you! PLEASE NOTE: Our rental equipment is only available for boat diving from our dive ship Susanna to Vinkeveen, they may not leave the dive ship for other purposes! You are responsible and liable for the rented diving materials, when you hand out the rental equipment you sign a rental agreement on which the replacement value per rented dive part is indicated, if there is damage / loss the indicated replacement value must be paid for You leave the dive ship again! Did you know that: We have a floating dive center on the Vinkeveense plassen? What makes boat diving for our daily expenses! That we really do diving lessons 7 days a week? that besides all SSI dive & EHBO / O2 / AED courses we are also qualified to give the most PADI dive & first aid / O2 / AED courses and we do (almost) all diving courses from our dive ship at no extra cost ... so also You can take a boat dive!